Quality crafted in Canada. Available in a variety of colors as shown, replicating killer-patterns for migrating Browns, Steelhead and Salmon. Our verl single egg imitators can be thrown under a float or as a second fly on a 2 fly rig. (please refer to your fishing regulations if double rigging is allowed) Verly eggs replicate a freshly fertilized egg strayed from the nest drifting down stream. Tied on Daiichi #10 scud x-strong hook with quality brand soft-fluffy yarn. Vibrant and subtle colors will entice even the shiest-pressured fish and get you hooked-up. the milty egg veil for the final touch. We have proven that if a fish takes and comes unbutton from the hook, if there are one or two eggs still on, just throw the fly rite back and you will get another shot and hook the same fish or one that was looking for the same meal. fly and attach a smaller stonefly or egg pattern to the rear of the hook and use as a 2 fly rig where it is allowed. 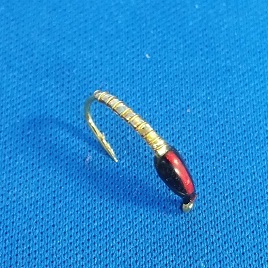 Tied on Quality Daiichi 1120 #10 hook and with a solid brass bead and pin. 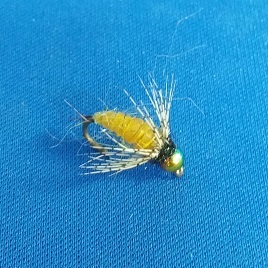 BEAD HEAD ESTAZ-TROUT TICKLER -This bug is another version of the estaz fly above but with a couple of key differences. Named the Trout Tickler, and although this has the same material for the egg, we have added 2 important looks to make this fly stand out above the rest.The 2 tails move very tantalizing in the smallest of current and the orange bead head is a Tungsten bead which gives it the weight to get down quicker and the look of a second egg. 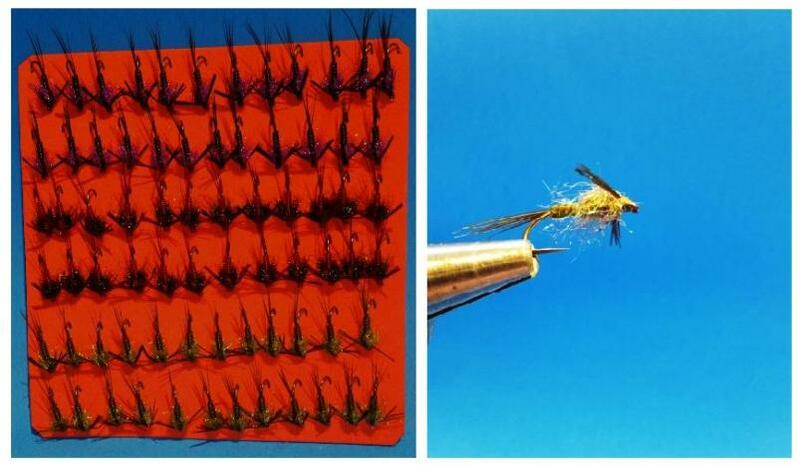 Same use as above, you can drift under an indicator or drift on the bottom .Have these 2 flies in you box and will be ready for whatever comes your way. Tied on Quality Daiichi 1120 #10 hook and bead and pin. C.A.C SELECT YARN FLIES - Egg diameter is consistent at about 10mm. Offered in 12 color combinations, ranging from the annoying buck-busting brights on the left to the shy-hen subtle colors on the right. These yarnies will handle just about any water conditions, clear or stained and will gain your landing confidence by their Daiichi 1120 wide gape scud in size #10, offering 2X strength on the hook to handle even those crazy springer's protecting their spawning beds. Look into these for pressured fish and when the spawn bags have been laid to rest! 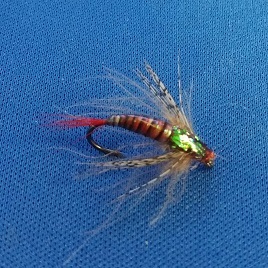 CARPET BUG -This fly originally tied by a gentleman named Mark Stothard who passed away some years ago. Our tier was fortunate enough to learn how to tie and use this fly and he's indicating that the steelhead are addicted to it. 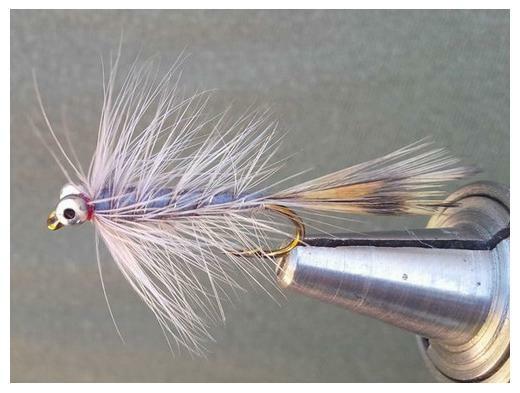 In any rivers, fished locally and abroad this fly is a must in your box. Tied in the colors that you see here, once it hits the water it looks just like roe. Throw it when salmon are spawning and watch as the browns hit it as they are gobbling up the eggs drifting down stream. The carpet bug is Tied on Daiichi #1530 bronze hook in choice #10 or #12 hook. Sucker Spawn - Chartreuse with flash dubbing added. Fl. Pink, Cream Cheese, Clear Pink. Sucker spawn is a great alternative when fish have seen all the eggs they can handle you serve them something different and you can get another fish or two to bite. We have added some sparkle to the chartreuse so when it is moving on the bottom it looks just like water bubbles are trapped. 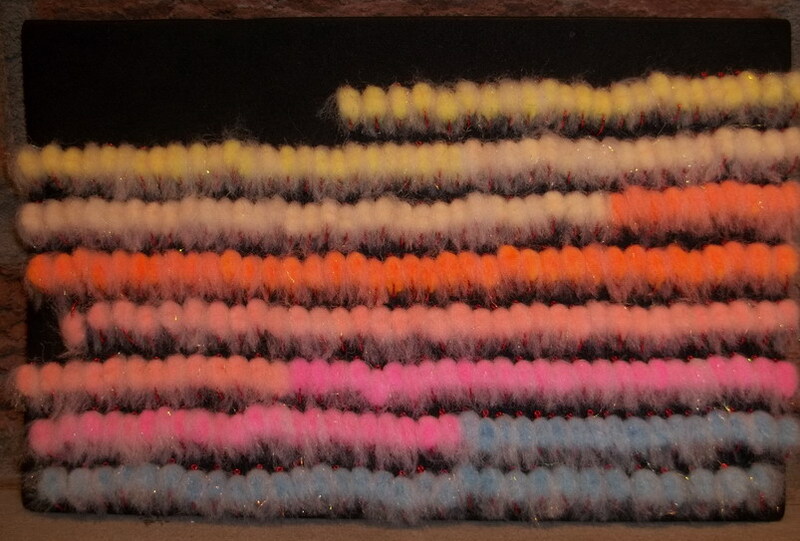 Even the rest of the colors, the Angora yarn has all these little fibres coming off of it and when the fish hits there teeth get stuck to the fly so they can't spit it out that quickly. Browns love sucker spawn and the steelhead are getting their fill also. Tied on sharp & strong #10 Daiichi 1120 Scud Hook. Sucker Spawn ~Bling~- Sucker spawn tied with Microbling yarn and a red bead just bellow the eye of the hook. This fly is another version of the sucker spawn tied above and just to give them something different to eat. 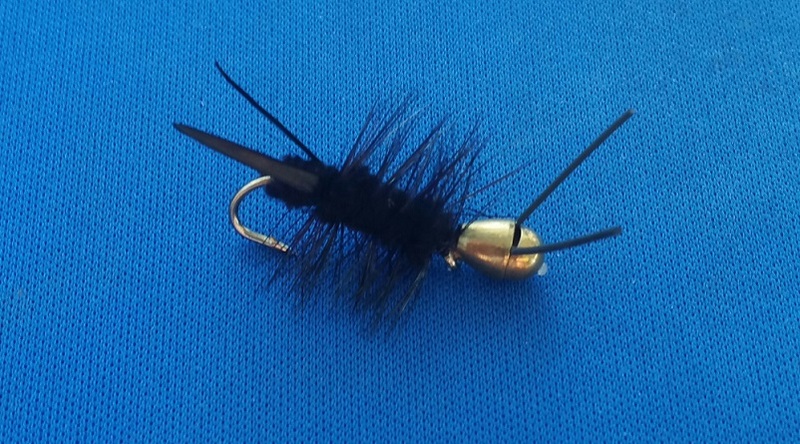 It has proven itself time and time again that this fly should be in your box. The sparkle in the yarn get's their attention and the bead is an added bonus. 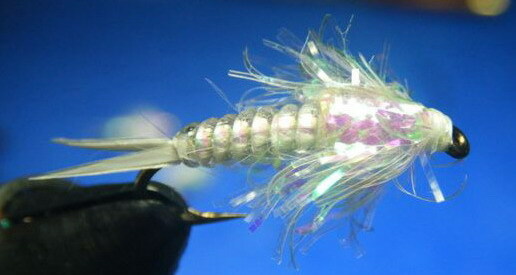 Chartreuse and egg colors have been the favorite for the big Browns and steelhead. In the spring the steelies will move six feet to nail these flies. Tied on Raven Specimen wide gape #12 red-bleeding hook. 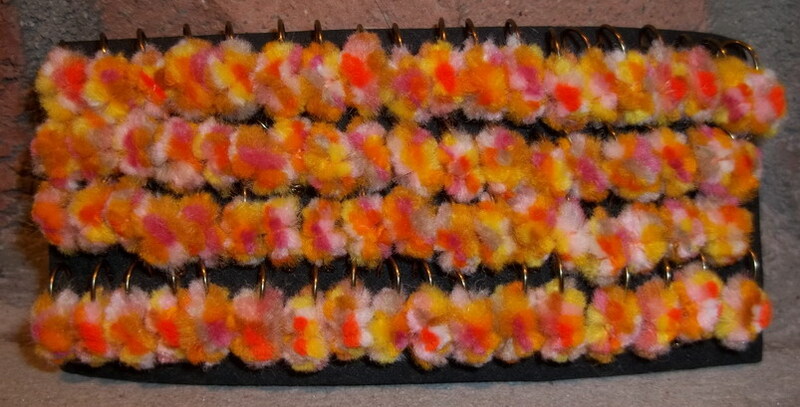 CAC YARN FLIES ..offered in singles. Tied on # 12 sedge hook, egg diameter's ranging from size 8-10 mm. Each package contains 2 or 3 of each egg fly from above. Three-tone color pattern yarnies. 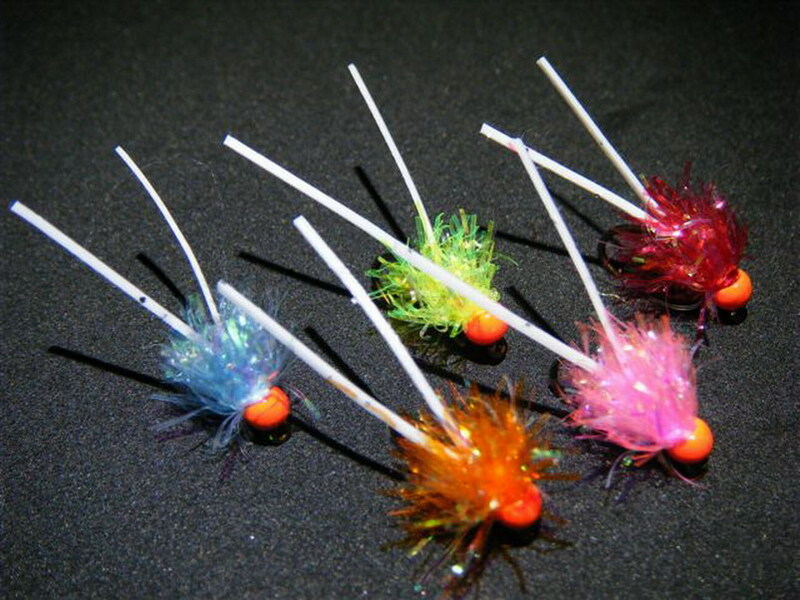 Excellent single egg imitators for drifting and targeting steelhead, salmon & browns. All flies are tied on bronze-chemically sharpened & Super-Strong Daiichi 1120 Scud #12 to hand on to that prized fish and guarantee landing confidence. Each egg measurers approximately 10mm in diameter. Each package contains 2 of each yarn fly from above. Simple pattern, especially suited for steelhead and salmon. Yarn flies are most productive when drifted along the bottom to imitate the movement of a natural egg. All flies are tied on sharp No.14 RAVEN® Specialist hook and measure approximately 6-7mm in diameter. Each package contains 1or2 of each egg fly from above. Instant yarn fly.. just spear the glo egg with the hook and pull up to the shank for an instant yarn fly! These pre-formed yarn balls have pearlescent spikes protruding from the circumference for added flash. They offer excellent opportunity when drifting as a single egg imitations or to add color to spawn sacs. The Crystal glo eggs offer a convenient to interchange presentation from a spawn sac to egg fly imitation while still using the same hook and not having to re-tie. 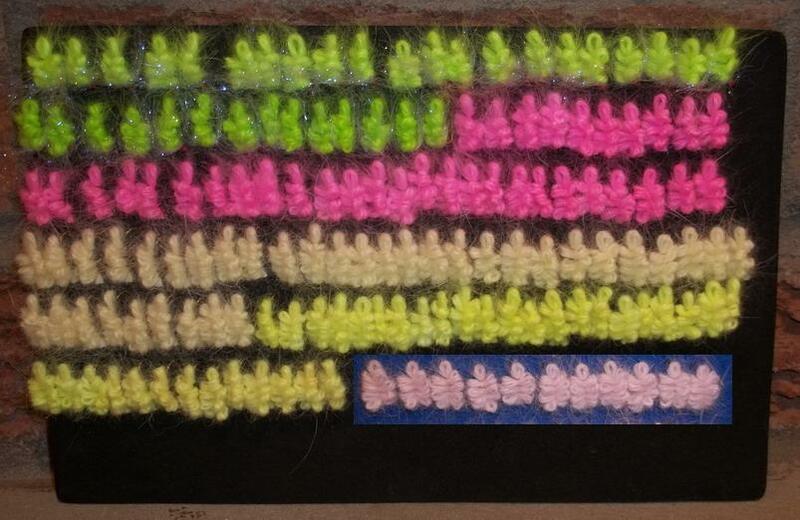 Each package contains 12-5mm glo eggs , offered in assorted colors in a per dozen-mix. Wapsi brand, M.I. Canada. Color-order in picture coincides with selection...from the top. Quality Crafted in Ontario, Canada. Scud flies offer a great way to target steelhead below a float. Just dead drift them near bottom and even slower ..shallow areas and they will ultimately materialize you a nice bow out for a kill. They come with an assorted of rainbow color beadheads and they actually differ in some ways between each patern so the presentation is always hot. Available in a Vivid-Orange and Oliv. Tied on Super-sharp Daiichi No.1150 2xwire #10 scud hook for extra-hold and landing confidence and a crucial part in your artificial arsenal. Quality crafted in Ontario, Canada. Killer imitator of salmonidae alevins-hatchlings in the small fry stage. We tested this new-concept streamer and it delivered time after time with massive jaw-breaking strikes from fresh steelhead, bow's & browns. Look into this fry when nothing else will produce, the pressure is on, counting on real-life presentations to produce in the stream environment. Silver-slate body produces a shiner-effect to the fish and the bulgy eyes just completes it.. Once they spot our "Natural Bow Killer" bets are off ..and they will travel the distance and turn in-to them for that live-savage hit. Every steelheader should have this in their box. It comes in a natural barred feather & hackle tied on Super-strong Daiichi No.2220 bronze streamer #8 hook & guaranteed landings. Quality Crafted in Ontario, Canada. Select UV Stoney with a touch of UV flash. 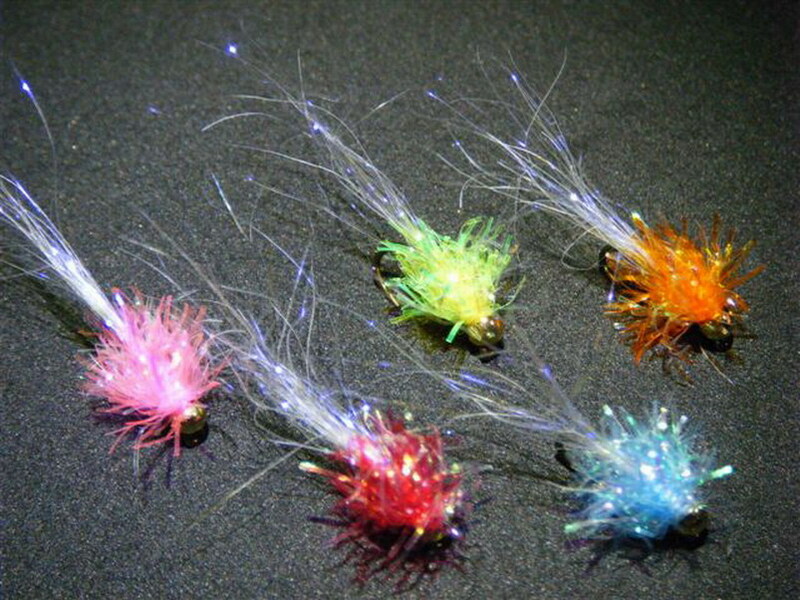 These offer a great meal for any weary trout and once they see them they will travel for the kill. Quality tied on a Daiichi 1760 #8 streamer hooks for extra-hold and landing confidence., which can withstand the battle of a big fish without bending out or breaking. Offered in UV Olive, Brown and Purple and feature an extra long tail and wings to complement the presentation for success and good fishing. Quality hasn't been spared on this fly and its a must have in your arsenal. Quality Crafted in Ontario, Canada. Dragon nymphs have been a great food source in lakes and ponds for bass, pan fish etc. In the rivers it is no different. with their big menacing eyes they will drive the trout nuts to smash them from stealing eggs and even smaller bait fish. It shouldn't be any different with the browns as they don't forget about them either or their high protein. Once they spot the dragon nymph all bets are off and they will travel a distance to get to them. Every angler should have them in there box. They come in Olive and Brown tied on Super-sharp Daiichi No.1750 -straight eye steamer hook for extra-hold and landing confidence. Quality Crafted in Ontario, Canada. CAC select beaded stone fly, with rubberized legs and extra fibers for a meaty presentation, enticing and bullying steelhead and salmon. Stoneys are a favourite, they are a big meal for any weary trout, once they key in on this bug, they will want to destroy it and crush it and move fast and long to get it. Quality tied on a Daiichi 1760 streamer hook #8, which can withstand any steelhead or salmon encounter without bending out or breaking. They come in Olive and Brown. Good Fishing! Quality Crafted in Ontario, Canada. Tarantula stones are the bullies of the river.They are a big meal for any weary trout and once they see them they will travel distance to trash them. They are tied on a Daiichi 1120 scud hook #6 and can withstand the battle of a big fish without bending out or braking. They come in Olive and Brown. Good Fishing! Quality Crafted in Ontario, Canada. The stonefly is a great source of food and protein and has a life span as a nymph about 3yrs.That means there are in our rivers a long time. 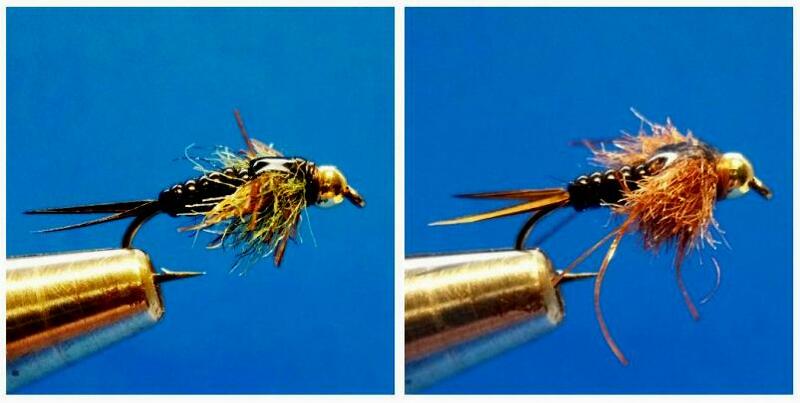 Black and brown stoneflies are what allot of anglers use. The golden stonefly is an under used fly.The color stands out and you can fish the big ones starting in late July as the hex nymphs come out all the way thru to November and December.They give the angler the edge to show the fish something else other than the usual nymphs. Browns love these and the steelhead key in on them very quickly when they are in the river. Tied on a Diiachi # 10 1760 it will hang on to that fish of a lifetime. Quality Crafted in Ontario, Canada. 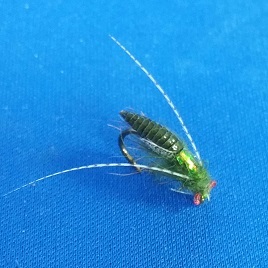 The Hex Nymph or Hexagenia as it is called in some areas is a great protein and staple food for big browns and rainbows. They can be as long as 3 inches and in the spring the bows are looking for a meal to get them and their strength back. 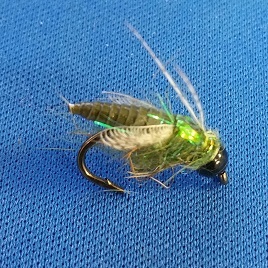 We use these flies in late summer and into the fall in streams throughout Lake Ontario and in New York and Erie shores. This is a go to fly for many anglers and should be in your box. These go quickly so don't wait to order. Tied on a Diiachi # 10 1760 it will hang on to that fish of a lifetime. Quality Crafted in Ontario, Canada. "CAC Selects" presents the "pale drifter" molting stonefly ..Although some stoneflies have a nymph life of 4years, they are a big food source for the trout. When they molt or change their skin they develop this creamy almost transparent look as they shed ..exposing them in their most vonurable time to the bows. This fly is sure to deliver! Especially in the Spring and Fall when the water has some color and presenting different is key. Tied on a #10 1760 Diiachi hook for added strength and landing confidence. 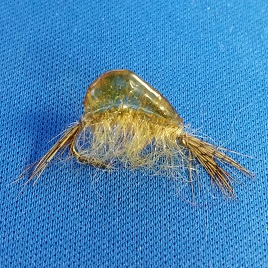 The egg sucking leech is very popular fly for steelhead and salmon fishing. These are quality tied with sharp Daiichi #8 streamer super-strong hooks, adequate marabou, and a few added strands of corrugated glis ‘n glow fibres for an iridescent flash presentation. Each package contains an assortment of egg sucking leech flies from above. "The Woolly Bugger"....You can't go wrong with this fly, as it suggest a leech or larva type trout foods in the river system, or just something that might be alive and edible. Available in Black, Brown, Olive, Pink and White. All flies are quality tied on Daiichi x-strong streamer hooks, and are available in singles, by the dozen, or assorted dozen. Each package contains a mix of all colors.